I am delighted to be here with you this evening to talk about something that has always been a significant part of my life – the relationship between our two islands. It is always important to express these positive sentiments at the best possible junctures – and by that, I mean, before the Six Nations starts. The rule of this House has become a widely accepted way for politicians and policy makers to speak and hear truth. A partially-closed door behind which we can truly engage with each other and speak our minds, freely and honestly – as friends should and as only friends can. However, on this occasion, we are not operating under this rule, and I am pleased that this is the case. I see real value in reflecting publicly on this vital relationship at a time of great change and uncertainty, although I still hope to speak – reasonably – freely and honestly. 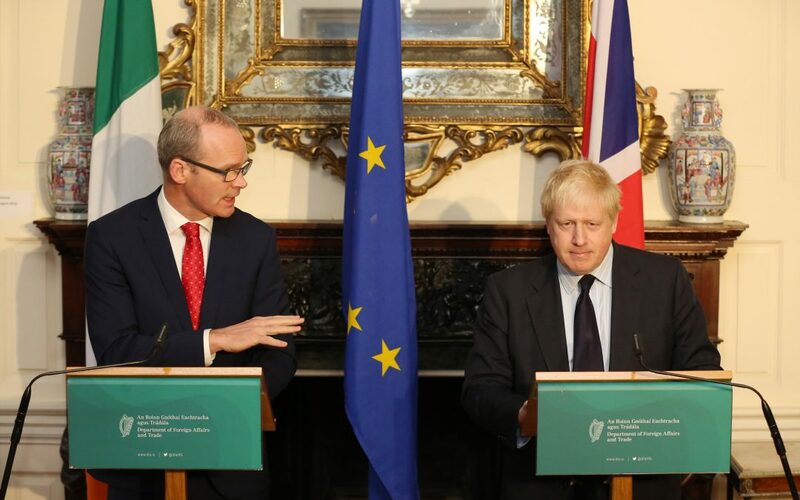 Too often, in the past, our bilateral relationship seemed to be defined by Northern Ireland and its difficulties – the political differences and the violent conflicts – and the differing perspectives from Dublin and London. Now, and over the last 18 months particularly, there is a danger that our relationship could be defined primarily, or almost exclusively by Brexit. I believe – I know – our relationship is deeper and richer and more enduring than the current focus on the UK’s departure from the EU, just as our relationship was always more layered and complex than it appeared during the troubles in Northern Ireland. However, we cannot be complacent. We have to work to maintain the “habit of cooperation” that we have known over the past four decades, working side by side in Brussels and elsewhere. Like all good friendships, there must be honesty and trust. While we often – usually, in fact – agree, we should be able to disagree too. In fact I’d go further: the capacity to disagree, openly and honestly, and then to move on, is the mark of genuine friendship. In the past, we had to work hard to develop and nurture this relationship, despite all the challenges. And we will have to keep on doing so. As we will lose the ’habit of cooperation’ around the EU table, we will have to use our existing bilateral mechanisms to greater effect. We are fortunate that there are already a number of East-West institutions, such as the British Irish Council and the British Irish Inter-Governmental Conference, which could be utilised to a fuller degree. We also have the British Irish Parliamentary Assembly and regular meetings of all our Permanent Secretaries and Secretaries General. And we may have to imagine anew too, in order to sustain our relationship and our connections. For instance, whether it is through new structures or existing ones, we should examine seriously the possibility of bringing both Governments together annually, in London or Dublin in alternate years, to discuss issues of mutual cooperation or concern. This annual summit of all senior Ministers would allow for cooperation across a broad range of issues of shared interest – everything from energy to the environment, and from transport to technology and employment. It could also be prepared for in the preceding weeks and months by teams of officials from the relevant Departments or Ministries. These structures matter as much because of the personal interactions they help facilitate as any kind of formal agendas. As the UK departs the EU, we don’t want to lose the kind of cooperation that can be fostered from a simple conversation on a corridor, or a cup of coffee on the margins of a meeting. British and Irish politicians and officials need to keep working and meeting together, to ensure that the understanding we have of each other does not diminish. This should be our shared future. But let me look backwards for a moment first. It’s perhaps an understatement to say that our shared history has not always been easy. There are some who might go back hundreds of years to make their case in that respect, but this is not compulsory. Within many of our lifetimes, there were periods when being Irish in Britain was deeply uncomfortable, as indeed was being British in Ireland. And looking back at the archives, it is clear that we didn’t always have the channels and contacts between Dublin and London that should have been there to address difficulties or knocks or mis-steps in our relationship. On occasion, the diplomatic contacts were good and yielded dividends – I can think of the great diplomatic work of early Irish Governments which worked with their Canadian and Australian and, yes, British counterparts to peacefully loosen the ties with London, and allow us to step out as a more fully independent State onto the world stage. We can recall the negotiations in the 1930s which peacefully, and in agreement with London, dismantled some difficult legacies of the Anglo-Irish Treaty. And we can think also of the Free Trade negotiations of the 1960s and preparations for us joining the European Economic Community together in 1973. However, these connections seemed to falter during the early years of the conflict in Northern Ireland. They weren’t as strong as they should have been – and it seemed for a time that our relationship would always be hampered and strained by that conflict. And, indeed, mediated almost exclusively through the prism of it. And yet, despite the pressures, we eventually found ways of working together to resolve it. And one of the great, unforeseen, gifts of the peace process was that, by working together, we rekindled our relationship. And we brought it to levels of positivity previous generations could scarcely have imagined. This yielded the Good Friday/Belfast Agreement, which marks its 20thanniversary this year. The genius of the Agreement is that it provides a framework for the totality of the relationships on our two islands – between communities in Northern Ireland, between North and South on the island of Ireland, and across the Irish Sea – underpinned by international support from the EU and US. I am always struck by just how carefully woven together these relationships are, despite the great forces and pressures of history. And by the intricacy and balance of the Agreement’s fundamental framework, with each of the three interlocking relationships reinforcing the others. Strengthen one, and you strengthen all; damage one and you damage all. And the Agreement removed barriers and borders – both physically, on the island of Ireland, and emotionally, between communities in Ireland, and between our two islands. Hence, our very real concerns about the implications of Brexit – especially a hard Brexit – for our island, and our shared peace process. Despite current political difficulties, it is right and proper that we collectively mark the anniversary of the Agreement – if only to recall once again the core tenets at its heart, the centrality of the interlocking relationships on and between these islands. We would forget them at our peril. And we would let those renewed contacts and relationships – especially at official and political level – falter at our peril. We must always tend them, and nurture them, no matter what the pressures or policy differences of the day may be. Before I inevitably turn to Brexit, let us take a moment to look at that richer, deeper, more complex relationship I spoke of earlier. I believe it was captured very well by our Taoiseach, Leo Varadkar, speaking in the European Parliament two weeks ago. There he spoke of the importance to him, and to the Irish people, of our relationship with the UK. He spoke of his Irish mother who was a nurse, and how she met and married his Indian father who was a doctor here in England. How his sister lives here with his English-born niece and nephew. This is not an uncommon story – I too have deep and personal ties here in Britain. I studied and worked here when I was younger. I have family here still. To say Ireland and the UK are close friends and neighbours is therefore far more than just a platitude. It is the reality of our lives. Over many generations, Britain has been the first place where our people sought work when our economy faltered. Emigrants came here to find work and, in doing so, provided Britain with a much needed labour force that built – and indeed after the Second World War, rebuilt – much of the physical infrastructure in your great cities. And they built the social infrastructure too. These were the teachers and nurses who taught and cared for the people of this country – here in London, Liverpool, Manchester and beyond – leaving a legacy of a deeply integrated Irish community, which has contributed greatly to the development of Britain today. In more recent times, as Ireland’s third level sector has expanded, our emigrants arrived here with a greater diversity of skills and life experiences than ever before. It is no surprise then that there are now over 60,000 Irish-born directors on the boards of UK companies. We have a trading relationship that is worth over £55 billion pounds, or €65 billion euro, every year and which sustains over 400,000 jobs across both islands. 38,000 Irish companies do business in Britain each year. Ireland is the UK’s 5th largest export destination. I know that in the Brexit debate here, there is a focus on the UK seeking to develop trading relations with high-growth, high-potential export partners. Whatever about places much further away, let me say that Ireland is one such partner, with an economy now forecast to grow by 4.4% in 2018. The flow of people over and back across the Irish Sea every day has made the Dublin-London air corridor the second busiest in the world. So business, and our trade relationship, is currently booming. And let me be very clear about one thing – we need that to continue. Ireland needs and wants a happy and prosperous UK. Let there be no ambiguity about that for a second. This helps shape the objectives we carry into this next phase of EU-UK negotiations. Speaking candidly, we all know that the decision of the UK to leave the EU has highlighted a major policy difference in how we see our relationship with Europe and, as such, will see Ireland and the UK pursue different paths in the years ahead. Without doubt, one of the core pillars of our stronger relationship over the past 40 years or so has been our shared membership of, and partnership in the European Union – stemming from our simultaneous accession, as I mentioned, with Denmark in 1973. Sitting around the EU table as equals and partners, our officials and political leaders learned to work together; we learned that we shared so much in common, both interests and values. And where we differed – and as a former Minister for Agriculture, I can think of one or two areas where we seriously differed – we learned the language of negotiation and of compromise – of win-win, not zero-sum. Some commentators here have asked why – ‘having joined together in 1973, we shouldn’t leave together in 2019’ – as if the intervening 45 years of membership were of no consequence. It is probably fair to say that our journeys as Member-States have been quite different. It is not for me to speak of the UK’s experience or perceptions of EU membership. However, as an Irish citizen born just one month after our accession referendum, as a citizen who has grown up in an Ireland visibly, demonstrably growing and benefitting from EU membership, I feel I am qualified to speak of our national experience. Ireland’s membership of what is now the European Union has quite simply been transformative. It has allowed us to develop and grow into a confident and relatively prosperous country, at ease with ourselves and our neighbours. Over the past 40 years, through extensive EU support, we have been able to invest in our infrastructure, our agriculture and our people. Working collectively with our EU partners on common foreign policy and security issues, our voice has become stronger, and our advocacy for a values-based world has been strengthened. Together with UN membership, EU membership has helped us – in the words of one of our many patriots, Robert Emmet – to take our place among the nations of the earth. In Ireland, we have an over 80% satisfaction rate with the EU among our population. We have a generally positively-disposed media. We have a young population which has benefitted hugely from programmes like Erasmus. And we have a science, research and enterprise base which has secured almost €500 million in EU Funding from Horizon 2020. We look around our EU table and we see friends and partners. We see Member States which, like us, stepped out onto the world stage after the cataclysm of the First World War. We see Member States which have also stepped out from under the shadow of stronger neighbours. We see Member States which have also known conflict and famine and emigration, and which now inhabit a sphere of peace and prosperity. In a word, we feel very comfortable around this table. We are therefore committed to the European ideal and to our place in Europe. We are, however, deeply disappointed that our closest neighbour and ally on so many issues is choosing a different course. The EU will be a lesser Union without the UK. But Ireland’s journey as a committed member of the European Union will continue. We want to do this while maintaining the closest possible relationship with Great Britain. And given what I have said about how our economies and societies are inter-twined, it can come as no surprise that we have viewed the potential impact of Brexit – especially a hard Brexit – with such concern. And it should have come as no surprise either that we worked so hard with the EU Task Force and our fellow EU partners during Phase 1 to protect our vital national interests, including the signature UK-Ireland achievement of the Northern Ireland Peace Process. We are very pleased that both the UK Government and the EU have prioritised the protection of the Good Friday Agreement, and the gains of the peace process, including no return to a border on the island of Ireland. And that we now have firm commitments in that regard and agreement on the outlines of how it can be achieved. I am also very pleased that the Common Travel Area has also been protected in these negotiations, allowing Irish and British people to continue to travel, live, work and access a range of rights and benefits in each other’s country. I look forward to seeing these commitments of Phase I formalised in Phase II, as we also work to ensure a very positive future EU-UK relationship. No doubt, there will be questions from the floor on Brexit-related issues and I will be happy to respond; but as our relationship should not be defined primarily by Brexit, nor should this speech! I will only make one further point on our future relationship. Because, as I said earlier, Ireland needs and wants a happy and prosperous UK, I hope the British Government and Parliament will reflect carefully on the path to that prosperity over the weeks to come. The most successful single market and customs union in the world – a market UK genius helped design – that market is on your doorstep. The British economy is integrated wholly into it, and gains from access to it to a degree that will be impossible to replicate from future UK-only trade deals with third countries. The EU and UK both stand to gain from the closest possible customs and regulatory partnership. And I hope the UK is ambitious in what it seeks in this respect, with an eye to what is achievable and where the EU is coming from. Ambition for the Irish-UK relationship is another thing. Most speeches about British-Irish relations in recent times have mentioned Queen Elizabeth’s visit to Ireland – including Cork! – in 2011, and the reciprocal visit here by President Michael D. Higgins in 2014. These visits were rightly seen as high points in our relationship that many in generations past could scarcely have envisaged. It became a truism, perhaps even a little clichéd and worn, to say that “Relations between us have never been better”. When things are going well of course, it means you have even more to lose. Looking forward, Ireland is choosing a different relationship with Europe to that sought by the UK. However, this does not change the fact that we will remain each other’s closest neighbours. And the bilateral ties between us remain deep and far-reaching and impossible to un-knot. And despite recent differences, I am happy to say that relations between our islands are strong. Of course, there are inevitable tensions that arise during difficult negotiations – and an issue like Brexit is exceptional in this respect – but, like any close friends, these do not and should never threaten the foundations of our friendship. And we should be ambitious for our friendship too. Foreign Secretary Boris Johnson, who I met again this morning, has spoken of a bridge across the English Channel to Europe. Others are talking of a bridge between Larne and Portpatrick in Scotland. And I certainly see no harm in looking at the feasibility of big infrastructural projects to link our islands, if a credible economic case for any initiative can be made. Metaphorical bridges are less costly, but no less valuable! So I think it’s useful to recall the multitude of ‘bridges’ already stretching across the Irish Sea – between our peoples, our Governments, our businesses, our cultural, sporting, scientific and educational institutions. The bridges that will allow us to continue to nurture our relationships long into the future. – “we live in the shadow and the shelter of one another”. The relationship between our countries is both vital and full of vitality, and one which we value greatly. I would urge everyone who cares about the relationship between our countries, to treat it with care. To protect and nurture it, and to invest in what brings us closer together.